The French for dilute is the irregular ER verb délayer. To remember this, imagine we will dilute the amount of whiskey in the bottle with water ... let's DELAY its bottling! to thin down, to debase, to add water to; to spin out (story). With some ER verbs ending in -ayer it is optional to replace the y with an i before a silent syllable. Examples of this family of verb conjugations: bégayer, délayer, effrayer, embrayer, enrayer, payer, pagayer, balayer. Broaden your French vocab quickly and easily with effective techniques like Cartoon Memory Triggers. To remember a word, just think of the pic! 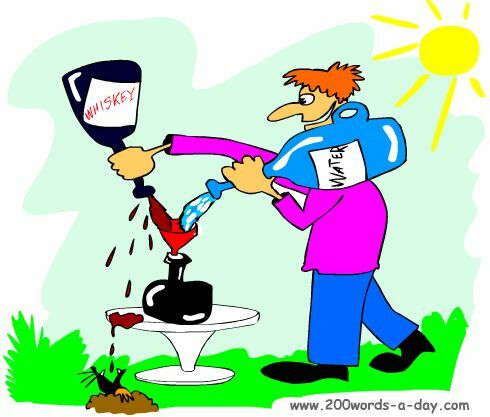 Imagine we will dilute the amount of whiskey in the bottle with water ... let's DELAY its bottling. délaye ! délayons ! délayez ! ✔ délayer is an irregular ER verb. ✔ Learn délayer and it will reinforce the pattern for ALL those other ER verbs. ✔ You can more easily remember words and verbs like the French verb délayer - French for dilute - using the techniques of the world's Memory Masters. 200 Words a Day! Free Daily French Lesson Online - the verb in French verb délayer - fully conjugated. French Learning Made Fun and Fast with your free Daily French Verb Lesson - délayer.